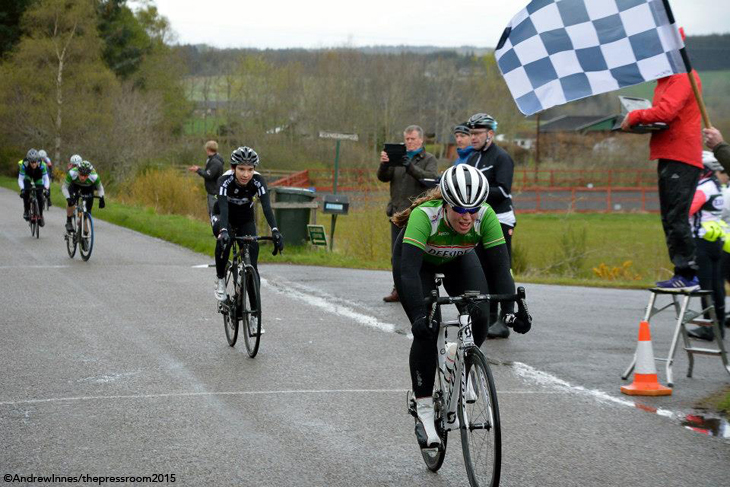 Last Sunday saw the second round of the Women’s Scottish Road Race Series, organised by Moray Firth CC and Dales Cycles, held in a very cold and windy Munlochy. 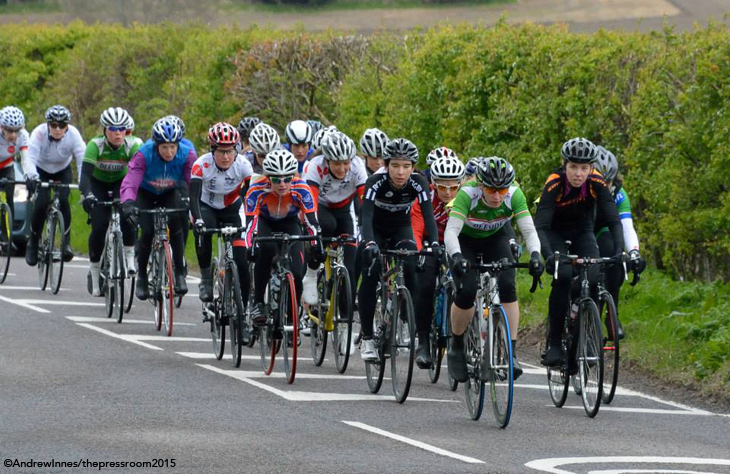 Thirty-two girls from all over Scotland signed on to race 5 laps of the 8.6mile circuit. Due to the windy conditions and nature of the course, positioning in the bunch and tactics were going to play a very important role in this race but everyone seemed excited, smiley and up for the challenge on the start line. After the neutralised sections, which led us out of the village of Munlochy, Chloe Fraser from Team Rytger was up front and set a steady pace. 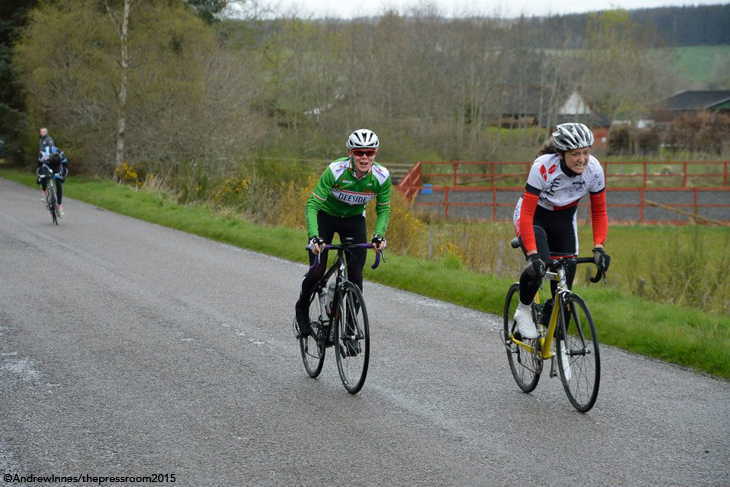 Riders from Deeside Thistle CC and Moray Firth CC were also in the mix and before long a small group of two riders made a breakaway. They managed to get a decent gap but were swiftly chased down by the main bunch. 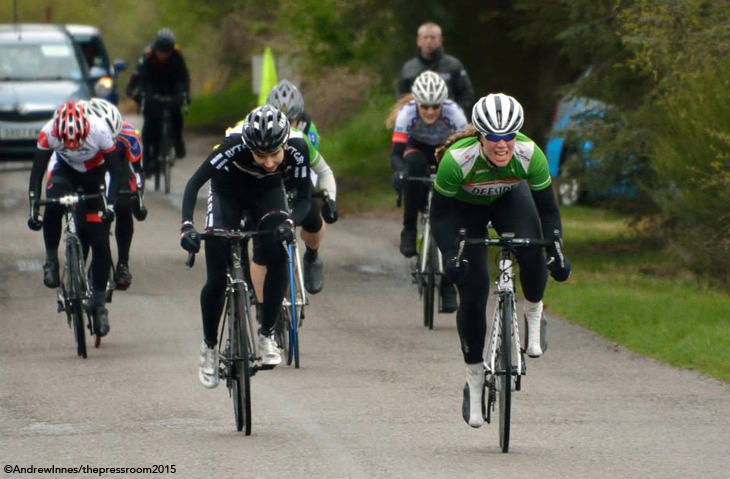 There were several breakaway attempts during the race, however it wasn’t until Chloe Fraser attacked on the final ascent through Munlochy that a breakaway managed to stick. Six other girls including myself chased down the attack and managed to work together to stay away from the main bunch until the finish. Coming round into the final straight the pace really picked up and I managed to get myself into a good position, protecting myself behind the bunch from the strong cross winds. Rounding the final corner I moved my way to the front of group and after a exhilarating bunch sprint I was super happy to take the win. Well done to Chloe Fraser who took second and Emily Middleditch from Deeside Thistle CC who took third! Chloe also managed to bag the Queen Of The Mountains prize and Lulu Bartlett took first Junior! I am also really happy to announce that Emily Middleditch, Amanda Tweedie and myself managed to win the Team Prize. Go Deeside Thistle!! Also massive thanks to Moray Firth CC, Dales Cycles and Scottish Cycling for organising the race and supporting the Women’s Scottish Road Race Series. These events would not be possible without your backing. I can’t wait for the next one! Stay tuned for Ashleigh next report and a look back at Round 1 from Fenwick by Peggy Series.